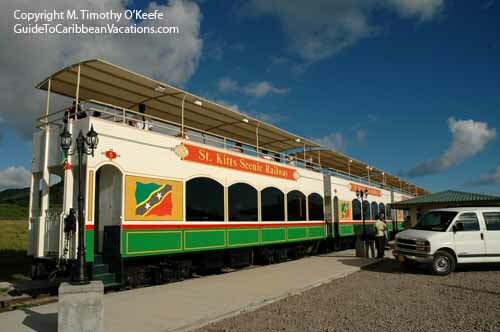 The St. Kitts Scenic Railway follows narrow gauge tracks that circle the entire island and a trip of four hours. However, most people travel only about two-thirds of the distance, a trip of under three hours. Depending on demand, the train makes up to three trips daily, starting at 9 a.m. In summer, however, the train may not even run every day. The Sugar train departs from the Needsmust Station near Basseterre's airport. The cost is US$89 for adults, US$49 for children and includes snacks and drinks. Yes--there are bathrooms in each passenger car. Full information is available at 1-869-465-7263 or www.St.KittsScenicRailway.com. But now, it's time to roll because the train is about to leave the station.